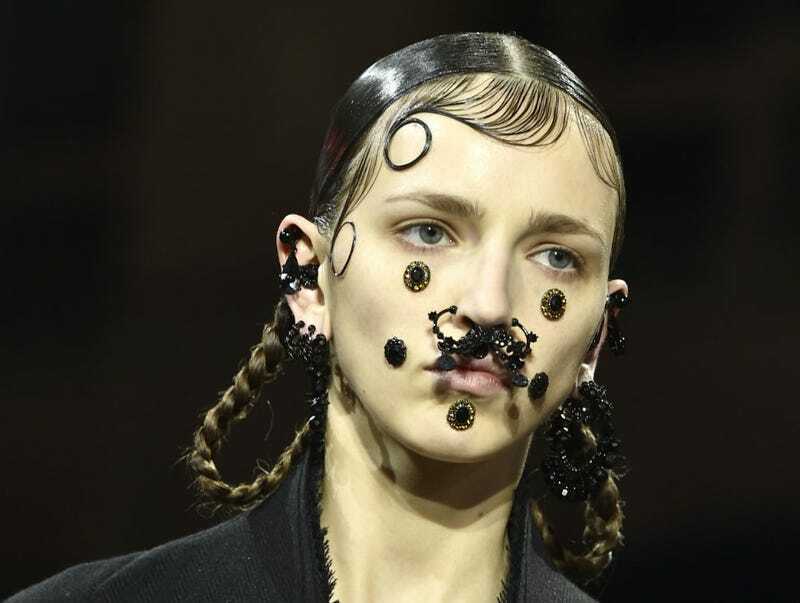 This is painful because Givenchy is one of my faves, but this is ridiculous: for Fall 2015, Riccardo Tisci sent a runway of models in baby hairs and nose rings, with stones glued to their faces a la piercings. Since FKA twigs appeared on the cover of I-D magazine back in 2012, fashion has been "discovering" and "re-discovering" the baby hairs/S-curl/septum piercing combination over and over, which had been twigs' signature for years, and have been black and Latina-girl staples for decades beyond that. Givenchy's runway line is actually extremely late in its Columbusing; right now, all over New York, there are giant wheat-pasted DKNY ads featuring white models like Cara Delevingne baby-hairing out as if they invented the style. And, of course, there was Katy Perry, who blatantly copped the style from the then-way-less-famous twigs, then reprised her look in the audience of Givenchy. This type of cultural appropriation by staggeringly rich and powerful people such as Tisci is so obnoxious to the point of exhaustion; my colleague Kara Brown has already written about it at length. Here, I would like to add that Tisci calls this look "Victorian chola girl," which I, too, have written about at length. Someone at Style.com actually wrote the words, "As an Italian, Tisci has always had a thing for Latin archetypes. The California chola girl qualifies." Latin archetypes! Haha. As a "Latin," there are not enough barfing emojis to convey to you the banal annoyance with which I feel about this. The dickheads have done it again, people! The dickheads have done it again. Who needs to take a shot? I think there's some Malört at the Deadspin table.